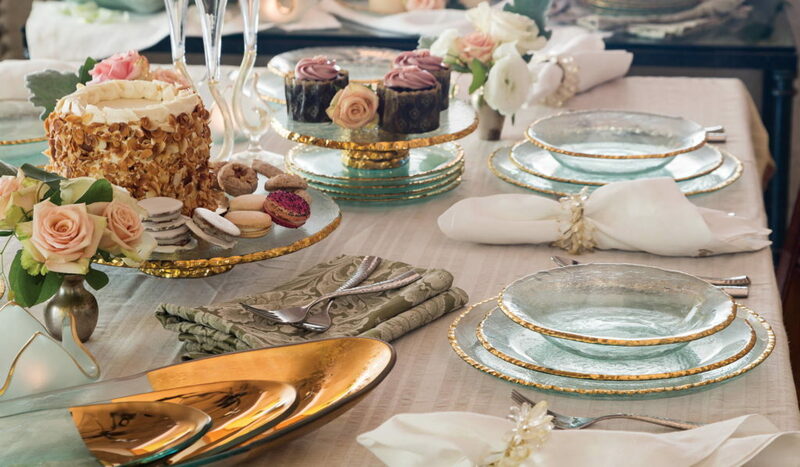 Select collections are hand painted with 24k gold and genuine platinum, and then each piece is individually set by hand into kilns, where at high temperatures the glass drapes over handmade ceramic molds. Precious metals permanently fuse to the glass during this step, and the glass “slumps” into their mold’s individual patterns, rendering each piece of Annieglass a unique work of art. The 24k gold and genuine platinum reveal our artisans’ individual brush strokes, as well as a slightly distressed appearance from the organic materials’ movement during kiln fire. These effects are by no means a defect, but rather are intentionally crafted into every unique Annieglass piece to celebrate the Japanese philosophy of wabi-sabi—in which asymmetry and “imperfection” enhance beauty. From the kiln to your table, Edgey is a collection of contemporary glass tableware – plates, platters, and bowls that exude sophisticated rawness and show-stopping beauty. Twice a year, Annie introduces new collections and extensions to existing ones. Inspirations are often Annie’s interpretations of her surroundings—the fantastic natural beauty of the Monterey Bay region and Santa Cruz Mountains, travel, science or history. Her design process is ongoing, experimenting in new ways with materials and technologies, often blending time-honored handcraft with modern innovations, or inventing her own methods to create the beauty of Annieglass alongside her talented team of artisans. Endlessly inspired by nature, Annie Morhauser became dedicated to environmental responsibility long before “green” became a trend. She participated in the first Earth Day as a teenager in 1970, and eco-sourcing, recycling, reusing and zero-waste goals have been standards for this atelier-turned-production-studio since opening in 1983.